7 South High Street Smithton, IL. 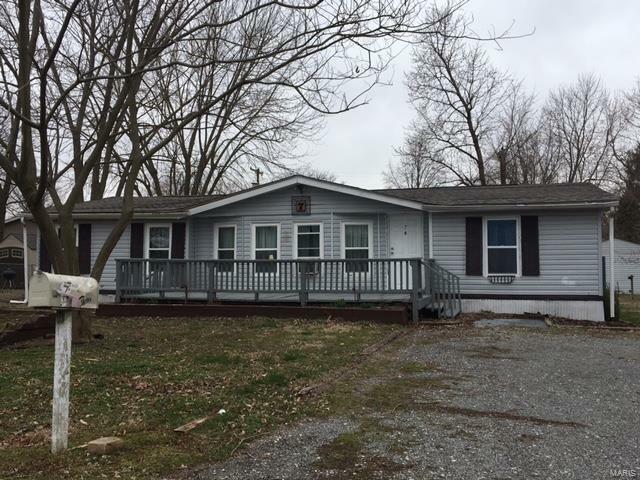 | MLS# 18021866 | Chuck Baer Realty, Inc - Homes for sale and rent in Cahokia, Dupo, E. St. Louis, Belleville, Waterloo, Columbia, OFallon and surrounding areas. CBR Property Management is a division of Chuck Baer Realty, Inc. offering property management and rentals. Wow, talk about affordable!! Own your own 3 bedroom, 2 bath home in Smithton. You not only get the large lot with the modular but the lot next door, too. (Parcel 13-33.0-206-015) That makes the total approximate lot size 143.9 wide X 150 deep!! This home has a new roof, new windows, new kitchen cabinets and counter tops and new laminate flooring. The large living room and large kitchen/dining room have vaulted ceilings, there is a separate laundry room and a large deck. There is a split bedroom floor plan and the master bedroom has its own bathroom with double bowl vanity and separate tub and shower. Just needs some finishing touches to make it your own. Sold in AS IS condition.